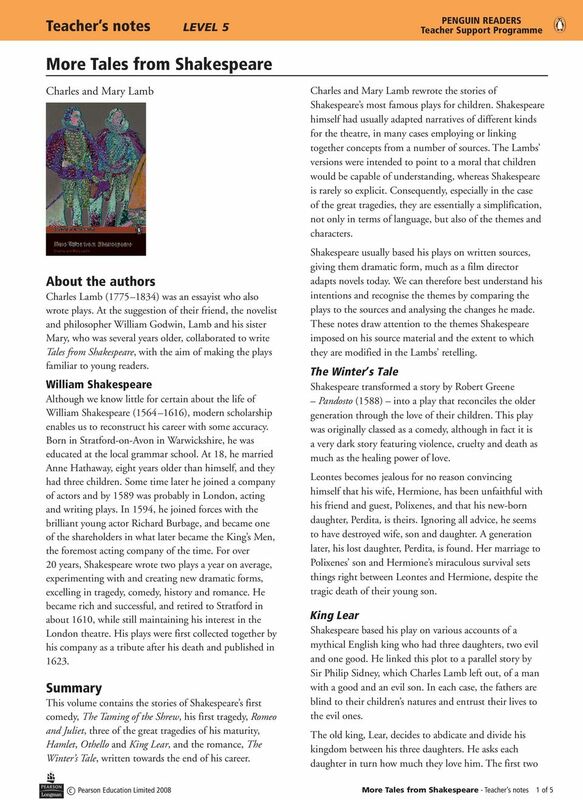 Download "More Tales from Shakespeare"
William Shakespeare. "Be not afraid of greatness: some are born great, some achieve greatness, and some have greatness thrust upon 'em. How do Shakespeare s tragedies follow the tradition of tragedy? Note: These activities are suitable for students who don t know a lot (possibly nothing at all) about Shakespeare s writing. One-lesson activity pack. If you only have time for one lesson before the show to prepare your students, here is a one-lesson activity pack. Qualities. Wiggle room to adjust. Causes suffering destruction. Heroic/ admirable/ exceptional. Degree? Define "heroic"
If my family had a feud (disagreement) with someone, I would be angry at them also. 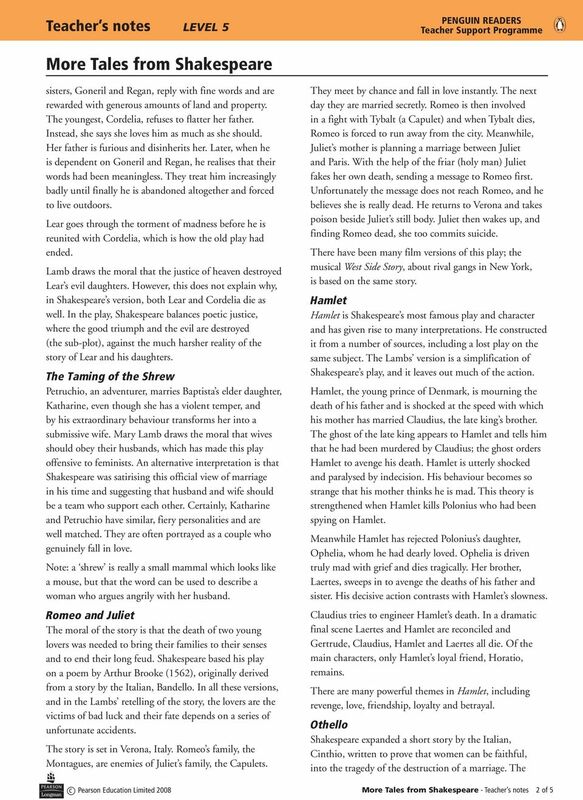 Romeo and Juliet a Play and Film Study Guide Teacher s Book Romeo and Juliet a Play and Film Study Guide This study guide was written for students with pre-intermediate to intermediate level English. Name: Date: Class: Read all directions carefully. When finished, review your test and check all answers. Othello. shakespeare for life. by William Shakespeare. Romeo & Juliet. shakespeare for life. By William Shakespeare. It is dark. Francisco, a guard, is standing outside the King s castle. He is looking around and listening. Two Example Sections. Quick Text. Featuring a translation into quick modern English. Romeo and Juliet. TASK: Find a map of Italy. Your map should be A4 size. Clearly label the major Italian cities. 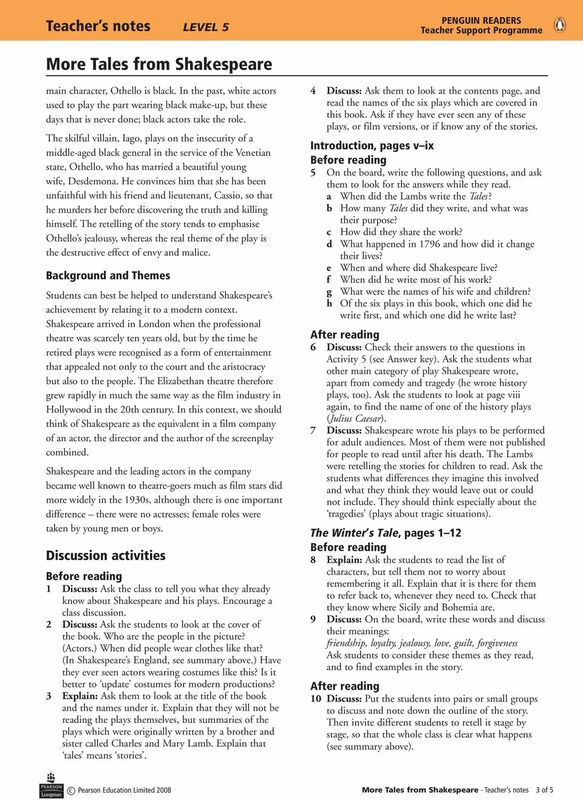 ROMEO AND JULIET Study Questions As you read the play either at home or in class, try to answer the questions as best you can and plan to come to class seeking the answers you could not get on your own. Prologue page 582) 1. What dramatic functions are served by the Prologue? Name: English I Romeo and Juliet Study Guide Act I Prologue page 582) 1. What dramatic functions are served by the Prologue? Scene I (pages 582-590) 2. How is the feud portrayed in the play s first scene? Romeo and Juliet Sample Analytical Paper Topics The following paper topics are based on the entire play. Following each topic is a thesis and sample outline. Use these as a starting point for your paper. 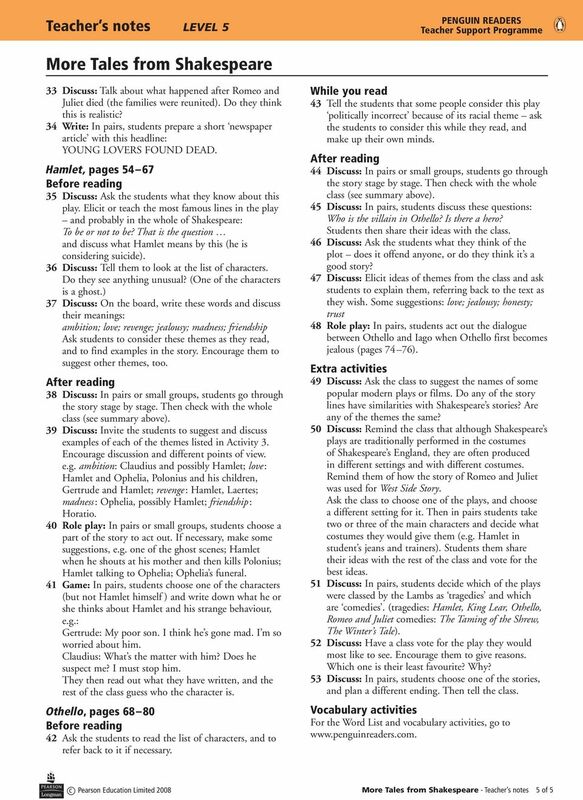 Nexus resource Romeo and Juliet Act 3 DARTs activities answers Subject: English Age range: 10 12, 12 14 Topic: Romeo and Juliet Licence information This resource is free to use for educational purposes. Othello. Teacher s Guide. Overview. About the Author. THE EXCHANGE QUESTION Who deserves your trust? PROLOGUE ROMEO AND JULIET STUDY QUESTIONS 1. A prologue gives the reader information. Explain what it says about the plot and length of the play. ACT I, SCENE 1 1. Why do Tybalt and Benvolio fight? 2. 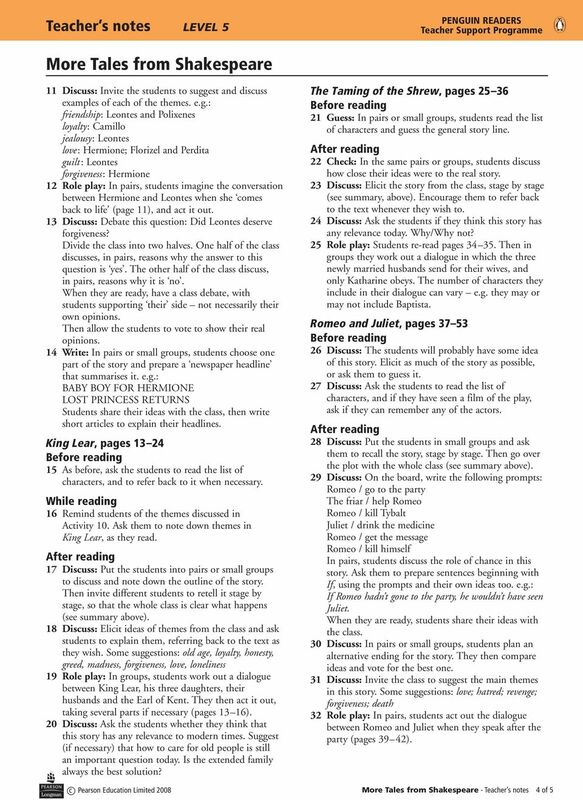 Name Date Period ROMEO AND JULIET: Act I Reading and Study Guide I. VOCABULARY: Define the following words. adversary boisterous nuptial aside blank verse characterization conflict External: 1. vs. 2. Text Analysis. Directions: Use this chart to analyze the characteristics of a tragedy in Romeo and Juliet. Write examples of each characteristic. Romeo and Juliet Questions Prologue 1. What is the purpose of the Prologue? 2. What events does the Prologue foreshadow? 3. What is the name of the poetic form which Shakespeare uses for the Prologue? Romeo and Juliet Mr. Ronzoni English 1. Directions: Answer each question in a complete sentence. Follow the calendar for due dates. Macbeth: Timeline. 3 witches plan to meet Macbeth: he is doomed from the start. Purpose: to show evil will influence events from the start. WORKSHOP LEARNING OBJECTIVE: Supproting English through exploring Romeo & Juliet via drama. Romeo and Juliet. 2. Benvolio (a Montague) and Tybalt (a Capulet) get involved in the fight. Which one to you seems most aggressive? Why? by Francis Gilbert, author of Starcrossed: Romeo and Juliet For Teenagers. Though this be madness, yet there is method in t.